Published by: Taito, 1990 | Developed by: A.I Co., Ltd. In the game the player goes through five levels, using throwing stars and special abilities called the "Ninja Arts", to stop a gang and the evil mastermind behind a slue of kidnappings, El Toro. One of the kidnapped is a student of the Black Manta's sensei, Taro. 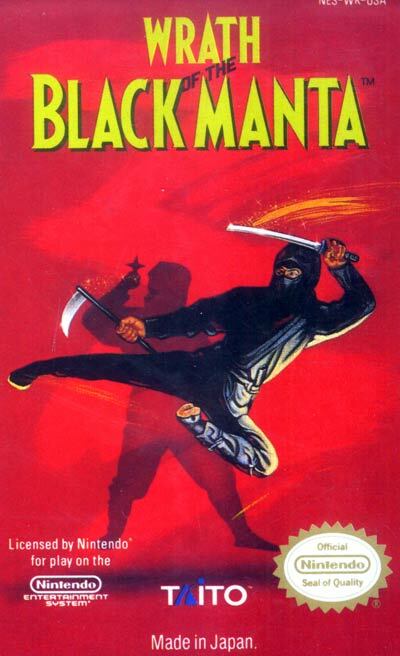 The Black Manta has many powers, which he gets after beating a level. The player can choose which power to use by pressing start. These powers can help the Black Manta defeat enemies and bosses more quickly. Part of last level is seen through a first person perspective. The Black Manta also has to defeat one of the bosses from the previous levels.